Alita: Battle Angel star reacts to her cyborg counterpart: "When I saw how much of me they put into her, I was pleasantly shocked"
Alita: Battle Angel is an adaptation of an almost 30-year-old manga series and the culmination of a 20-year passion project from James Cameron, but you probably know it from the trailers as that movie with the absurdly big-eyed woman. It's an idiosyncratic decision - true to her look in the manga while setting aside the fact that such characters tend to have big eyes in general - that’s just one of many ways the film is pushing the intersection of visual effects and real-life performances in unexpected directions. “What we have been able to achieve in terms of the performance capture... is unprecedented,” producer Jon Landau told our sister magazine SFX for its latest issue. 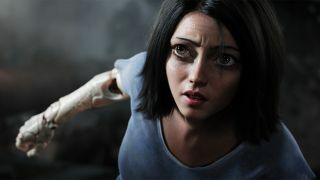 He explained actress Rosa Salazar had two lightweight HD cameras mounted on her throughout the production, capturing all the “subtleties and quirks” of her performance to use as Weta Workshop digitally transformed her into amnesiac cyborg Alita. Put pictures of the two side-by-side and you may notice a resemblance, but once Salazar herself saw Alita in motion, she was shaken (in a good way). "I kept repeating: 'That’s me!' I didn’t know what to expect," Salazar said. "When I saw how much of me they put into her, I was pleasantly shocked. And it was more than I could’ve ever imagined or dreamed of. It’s never been done." Alita: Battle Angel's widespread debut (February 6 in the UK and February 14, Valentine's Day, in the US) will show whether audiences are captivated or repulsed. Either way, I doubt they'll be bored by this vision of our far future. You can read more about Alita: Battle Angel and more great movies coming this year in the latest issue of SFX magazine. If you're interested, make sure you subscribe ASAP so you never miss an issue.